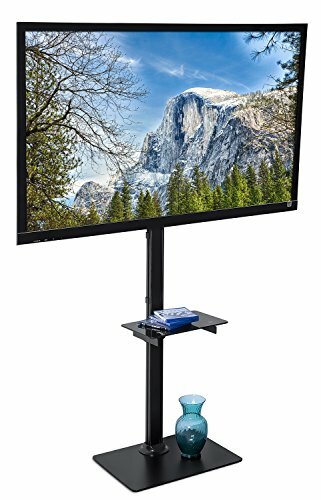 Elitech TV Display Portable Floor Stand With Middle Shelf and Height Adjustable Mount for Flat Panel LED LCD Plasma Screen 32" to 55"
Height Adjustable TV Mounting Floor Stand. 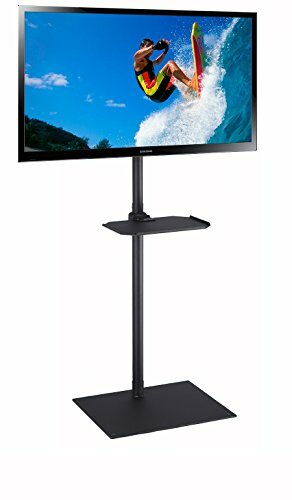 This sturdy TV stand mounts the majority of flat screens from 32" to 55" in size and has a weight capacity up to 66 lbs. Features include telescoping height adjustment with a maximum screen height of 56.7", and metal middle shelf 9.8" x 13.8". 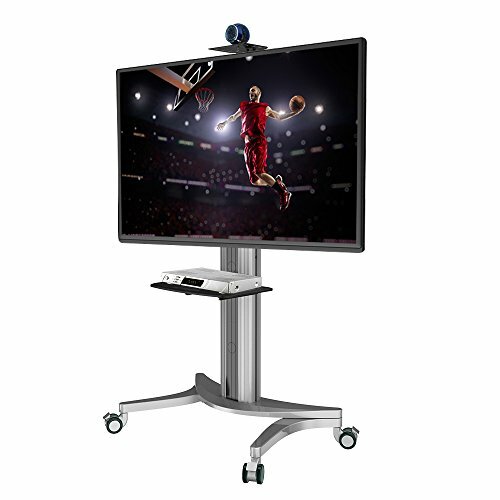 The mounting bracket has 20 degree tilting so monitor can be set to desired viewing angles, and is VESA compliant supporting up to 400 x 400 mm mounting holes. Expandable to 600 x 600 mm with adaptor ACC214 (Sell separately ASIN B01F6CU9NY). Stand assembly is simple and comes with necessary tools and hardware. 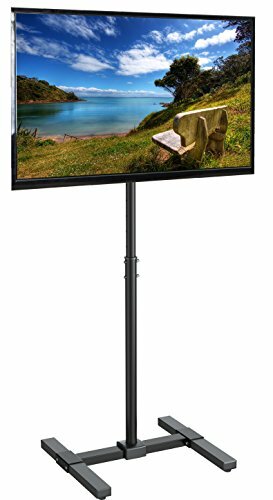 Elitech TV Display Portable Floor Stand Height Adjustable Mount for Flat Panel LED LCD Plasma Screen 32" to 55"
Height Adjustable TV Mounting Floor Stand. This sturdy TV stand mounts the majority of flat screens from 32" to 55" in size and has a weight capacity up to 66 lbs. 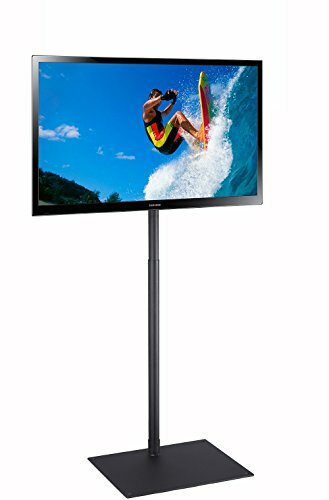 Features include telescoping height adjustment with a maximum screen height of 56.7". 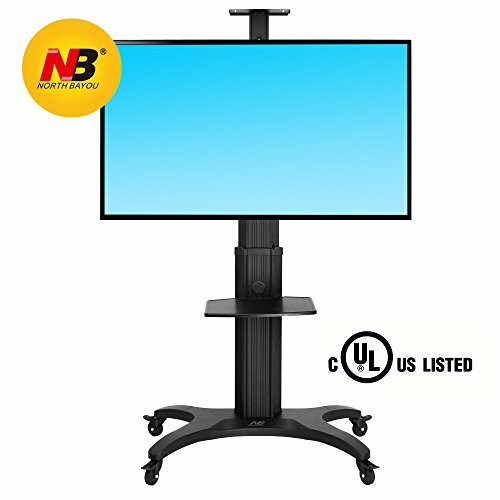 The mounting bracket has 20 degree tilting so monitor can be set to desired viewing angles, and is VESA compliant supporting up to 400 x 400 mm mounting holes. 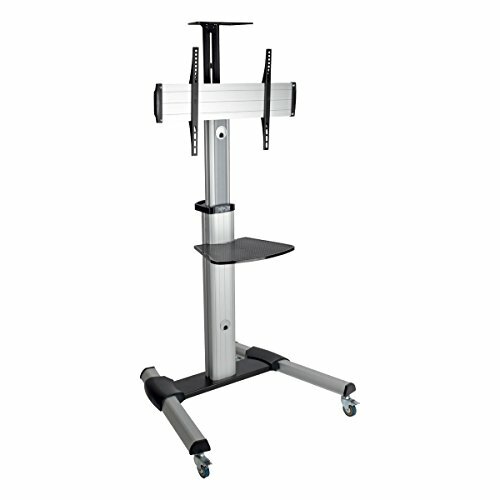 Stand assembly is simple and comes with necessary tools and hardware. The Pyle TV Monitor Stand is portable, versatile, and durable. Its foldable design makes it perfect for travel and presentations. It’s VESA universal standard size works with LCD, LED, smart, 3D, plasma and flat panel TVs. Perfect for home, office, classroom or studio. Features: Universal Standard VESA Mount Compatible with All of Today’s Latest TVs, Monitors, Display ScreensTilt & Height Adjustable with Locking Mechanism Hassle-Free & Portable Screen Display Placement Foldable Tripod Design for Easy Setup & Storage Heavy Duty, Rugged & ReliableReinforced Metal Construction Anti-Slip Padded Rubber Legs Works with LCD, LED, Smart, 3D, Plasma, Flat Panel TVs, etc. 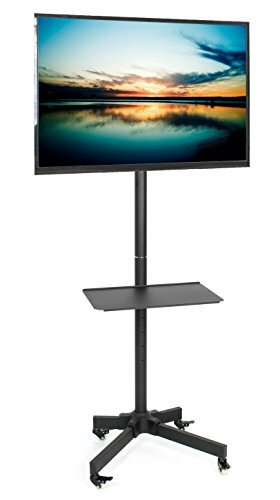 Perfect for the Home, Office, Classroom or Studio Technical Specs: Maximum TV Size Compatibility: Up to 32’’ VESA Compatibility: 75x75, 100x100 Height Adjustment: 32.3’’ - 59.8’’ Tilt Adjustment: 0 - 360 Degrees Construction Material: Steel Alloy Steel Tube Thickness: 1mm (0.04’’) Assembled Dimensions: 27.5’’ x 27.5’’ x 59.8’’ Folded Dimensions: 34.2’’ x 4.5’’ x 3.9’’ Max. Weight Load Capacity: 22 lbs. Sold as: 1 Weight: 6.5 lbs.